The little vase and flower...even the way that this photograph came out is a mystery. 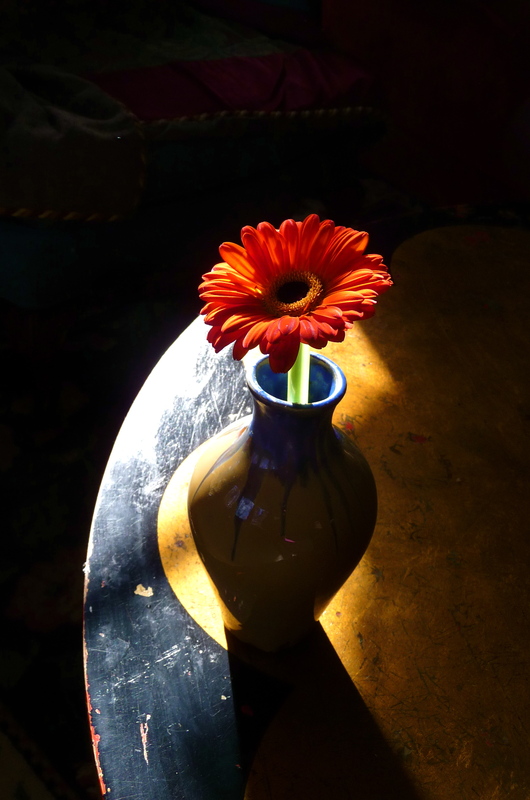 A beam of light had just poured into my living room, and I put the vase on the corner of the table, took the picture and was so surprised to see the way it looked! I pulled out this little vase to give to a friend a few days ago and kept looking at the size of the opening thinking, “It will only hold one flower.” I decided against getting a flower, and gave her another gift instead, but didn’t put the vase away. When we met on Sunday, she handed me a flower. One flower. I didn’t realize the serendipity of this until I got home and saw the vase on my kitchen counter. Previous postWhat will my intuition toss up to me today?! Don’t you just love the sense of humor Spirit has? For me, this flower and vase is a chicken! Lovely! It really is stunning! Very cosmic and multidimensional, which reflects the serendipitous (love that word!) interaction with your friend! Thanks for sharing this, and the powerful quote. It’s true art, Mary! Just wonderful. I too am often delightfully surprised when I take a photo…especially of animals….and the results are not at all what I had expected…a gift of light. A reminder that the light is always with us, eh? And the one flower….so poignant. I have been reading back through your blog – what a wonderful, warm, inspiring, and wise place to visit. I’ve been smiling so much my jaws ache. You are an inspiration – your honesty is breathtaking. WOW! Several times I tried to comment, but alas the comments for those entries were closed. But never mind – I’m subscribed now and will journey with you from now on. Thank you for finding me so I could discover you. Oh Mary…I’m just catching up with the past few posts since I was away. I can’t help but to juxtapose yesterday’s picture of your friend’s daughter, Delaney, with today’s solitary flower. Both full of vibrant color, both looking up, both full of beauty, fun, hope, growth…light. I have only “one” thing to add today – as this song started singing itself inside my head as I read Mary’s story about the one perfect flower and that beautiful vase. It is one of my very favorite songs sung by Gillian Welch. “One Little Song”. Enjoy! Ah, Susan…this song just made my day. Simple lyrics that say so much. Beautiful photo Mary! Your talents are many. It really is the small quiet moments that add up to make our lives more lovely and serendipitous (love that word). Susan, I love this song and this artist, going to check out I tunes for her! Gorgeous photo! And thank you for sharing this quote. Reading it made me realize that, according to Lewis Mumford, I have no poverty-stricken days. For that, I am most grateful. Love this, Cheryl B. It captures our WFF roost perfectly! Love it! WFF is such a nice place to “be”! This is a breath of fresh air that just filled my lungs and balanced me after a tumbling two days of an emotional rollercoaster around some sickness in the family. Thank you, Mary. That quote is priceless! You are so comforting. I always wish I could just “like” so many of the comments that follow your blogs in support all the WFF gang. Headingoutside I so agree!!!! “Thank you for finding me so I could discover you.” Well put! This blog makes for such a nice peaceful part of my day, always! I too saw a stylized chicken in this photo. Gorgeous. Thank you for the reminder to pay attention, to SEE the beauty in the everyday. Just lovely, duckies! Just ducky, you lovelies! Isn’t serendipity a blessing? !